If you are using a Flex SDK before 3.5a then it’s probably time to update. Flex SDKs before 3.4 have a security vulnerability. I believe the problem is actually in the HTML template, so when you update make sure that you also update the HTML templates that you are using. The Flex SDK 3.4 had the double responder bug. And the initial release of Flex SDK 3.5 had a bug with AIR’s ApplicationUpdaterUI. If you overlay your own AIR SDK on top of the Flex SDK then be aware that you will actually be overwriting the ApplicationUpdaterUI fix (comments in the bug report discuss how to deal with that). So it’s time to move to the latest Flex SDK 3.5a! Also, if you are using BlazeDS, LCDS, or FDS then it’s time to update that as well due to a security vulnerability that was published yesterday. UPDATE 2: I’ve done a second part to this screencast that combines Flex 4, Flash Builder 4, Spring 3, BlazeDS 4, and Hibernate 3. UPDATE 3: A Refcard on Integrating Spring 3 and Flex 4, which I co-authored, is now available! It provides a step-by-step tutorial for setting up everything I show in the video below. Connecting a Flex 4 application to a Java / Spring back-end couldn’t be easier in Flash Builder 4’s new Data Wizards. I’ve recorded a screencast that shows how to set up the web application project, configure Spring & BlazeDS, and then build a Flex 4 application that connects to the Java / Spring back-end. Check it out and let me know what you think. 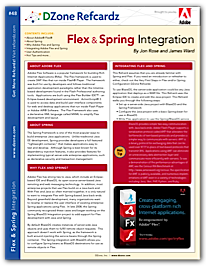 DZone has just published a new Refcard “Flex & Spring Integration” written by Jon Rose and me. This is the second Refcard I’ve written. The first was “Very First Steps in Flex,” which was a few chapters from First Steps in Flex written by Bruce Eckel and me. Working on the Flex & Spring Integration Refcard was fun because I was able to learn more about the new Spring BlazeDS Integration project from SpringSource. I’ve been really impressed with how easy it is to integrate Flex and Spring together. Another great resource for learning how to integrate Flex and Spring is Christophe Coenraets’ Spring BlazeDS Integration Test Drive. It contains a bunch of great examples that will help you better understand how to get everything set up and working. Let me know what you think about the Refcard. I hope it’s useful for you!